Last week we went off the beaten path and spent several days in the Wrangell-St Elias National Park. Wrangell-St Elias is the largest U.S. national park. It equals six Yellowstones, with mountain peaks upon mountain peaks and glacier after glacier. Follow any river or stream to its source and you will find a receding, an advancing, or a tidewater glacier. In all of the parks 13.2 million acres, there are only two short roads, the McCarthy Road and the Nabasna Road, both unpaved. We drove on paved roads to the town of Chitnia (CHIT-na), about 300 miles from Fairbanks down the Richardson and Edgerton Highways. All of the main roads in Alaska have names…there’s only about a dozen of them. More about that some other time. 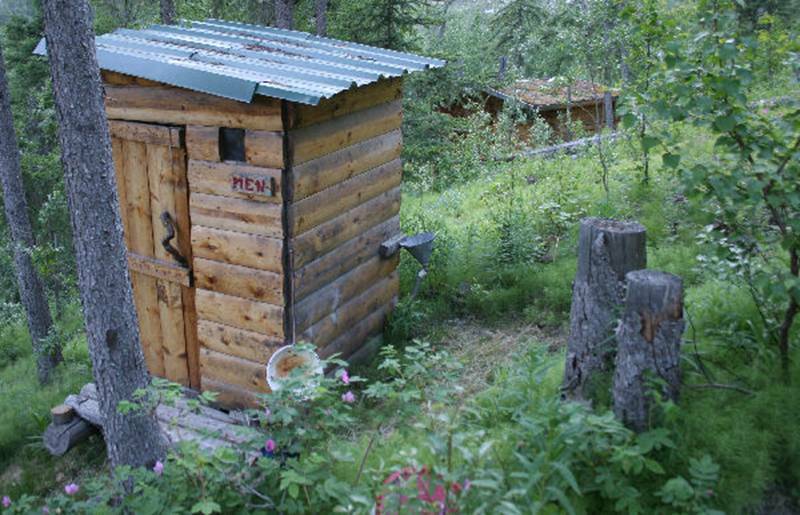 Anyway, we spent the night in a tiny cabin on a hillside with electricity, but no running water, and an outhouse. As you can see there were facilities for the men (around the corner) as well as those for the ladies (inside)! That’s our cabin in the background. From Chitna, travelers take the McCarthy road to the town of…McCarthy! It’s a sixty mile, one lane, gravel road that follows the old rail bed of the CR&NW Rail Road…that’s the Copper River & Northwestern, or as the locals used to say, Can’t Run and Never Will. Anyway, the railroad stopped running in 1938 and eventually the rails were torn up, tossed over to the side of the road (they’re still there) and more gravel was spread to make a “drivable” road. It says something about the road that at each end there is a going tire repair business! We chose not to drive the F-550 down that road, so we left it at the Chitina Airport and took a shuttle van into McCarthy. From McCarthy, a very small town with about 40 year round residents, we took another shuttle van to an even smaller town five miles away. 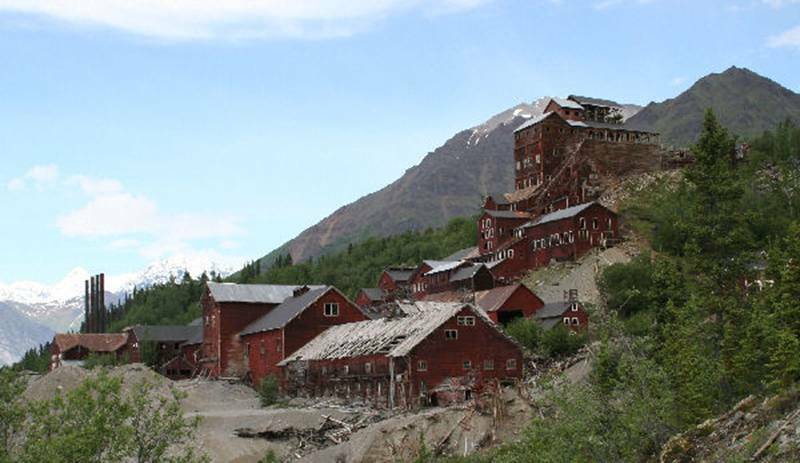 Kennicott is an abandoned copper mining town that the folks literally walked (or road the last train) away from in 1938. The mining company which owned the town was named after the Kennicott Glacier, which used to dominate the valley. Fore some reason, the founder of the mining company named it the Kennecott Mines Company. It later became the Kennecott Copper Corporation. We took a great tour through these old buildings, but we did not actually get near any of the mines. There were 5 or 6 mines further up the mountains, the nearest of which was an all day, “strenuous” hike. The building at the top right of the picture is the mill building, where the ore from all of the mines was brought to be crushed and the copper ore separated out for train shipment to Cordova from whence it was shipped to the lower 48. The mill building is a magnificent 14 story wood building into which the ore was dumped for processing. Large chunks were put into the top floor and crushed and filtered through the 14 stories by a variety of rollers and “shaker tables” until the product that came out of the bottom was a very high grade copper ore. We toured every floor and got a first hand look at the various pieces of equipment, many of which could still function after all these years. The following day we took a hike out onto Root Glacier. We had a guide and were supplied with crampons to strap onto our hiking boots. For those not in the know, crampons are spikes that are strapped on to the bottom of boots for traction on snow and ice. They have 10-16 sharp points protruding downwards about an inch in length. We hiked about two miles up the valley to the edge of Root Glacier where we stopped to put on our crampons. 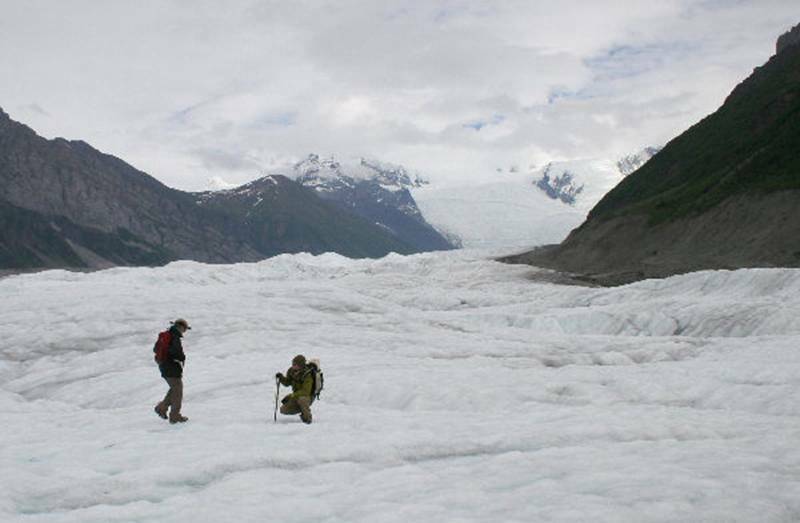 Then, with the guide’s help, we hiked about a mile up the glacier. It was way cool…in all respects. There were waterfalls on the glacier feeding rushing streams. 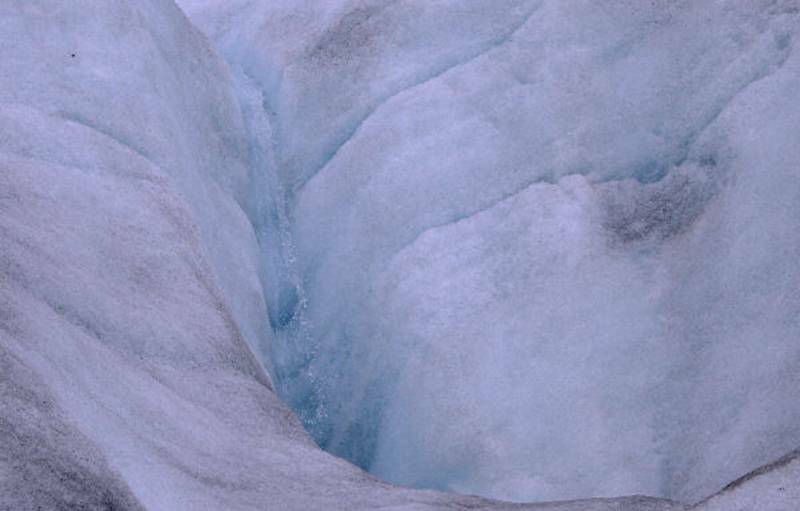 Occasionally there were "moulans" which are super-blue pools of water, some small crevasses and a few ice caves. This picture of Paula and our guide should give you some idea of the scale of the place. We stopped and had lunch in the middle of the glacier and then hiked back to Kennicott. In all, a magnificent six hour experience. 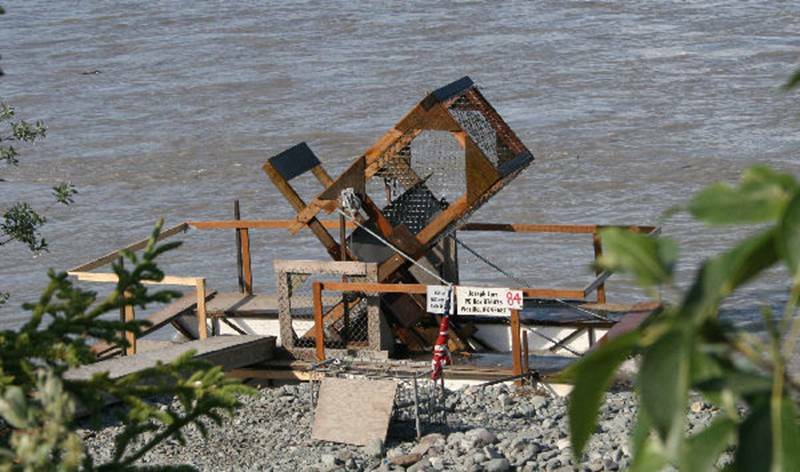 The next day we flew back to the Chitina airport. The Copper River passes right by the airport and the local folks were out catching Copper River Red Salmon and King Salmon either in dip nets (hard to imagine) or in their fish wheels. This is a fish wheel or half of one anyway. The other half is under water. It is turned by the current of the river, going from left to right in the photo. Fish swimming along in the current swim get scooped into the basket, which keeps turning. As the wheel gets to the top of the arc, the fish slides down the chute and plops into a box which is partially under water. The fisher-person watches all this from a comfortable chair and reaches into the cooler and pops another beer! At the end of an hour or a day (depending on the fishing), the fisher-person walks down the plank, reaches into the basket and plucks out several 30 to 40 pound salmon! Now, that’s MY kind of fishing!